Well, we’re not having to take medicine, but Tom being out of a job can feel bitter to a degree. That is if all you think about is what you don’t have or can’t do, etc. So I came up with some “sugar” so to speak, to help Tom as long as he is without a job. Only God knows how long this season will last, but we might as well have some fun with it in the meantime. 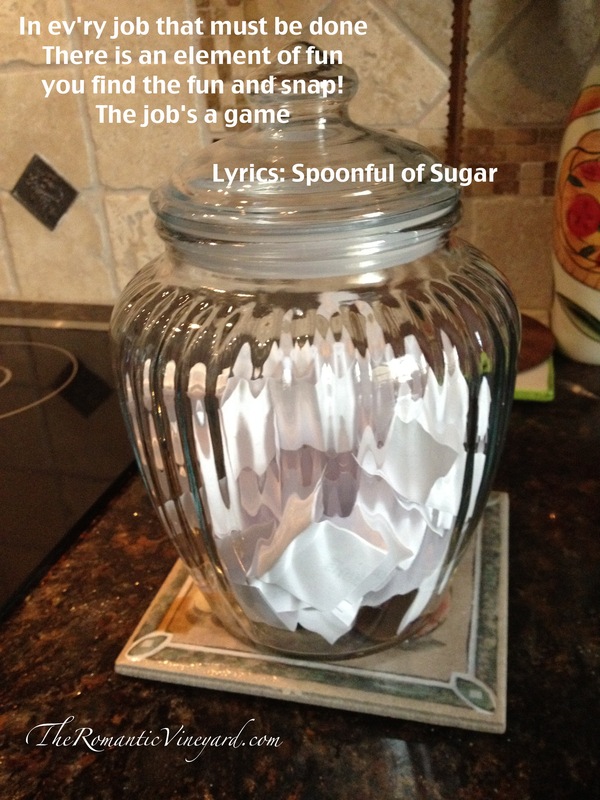 I made Tom something I call the Jobless Jar of Adventure. I know it’s corny. Tom rolled his eyes at me too, but the idea is good. I typed out at least 30 different things we can do together that are free or very inexpensive. Some are things we’ve done before and enjoyed, and some are things we’ve wanted to do, but have never had the chance. I cut them into strips, folded them, and placed them in the candy jar he used to have on his desk. I wrote him a letter explaining that when he had a day with nothing to do, or if he was feeling bored or blue, he could take one strip of paper out of the jar for us to do that day. If the adventure listed wasn’t feasible to do that day, he could draw another one–but only once. I hid the jar with five pennies next to it along with the letter. I wrote a little note on his bathroom mirror telling him there was a surprise waiting for him and where he could find it. How do you help your spouse when they’re going through a difficult time? Sometimes a little romance can help brighten their day in a way nothing else could. This is post #26 in the Ultimate Blog Challenge to post everyday in July. This entry was posted in Christian Marriage, Difficulty, Romance, Romance in Marriage, romancing your husband, romancing your spouse and tagged A Spoonful of Sugar, Disney, Julie Andrews, Mary Poppins. Bookmark the permalink. You are the best cheerleader a daughter-in-law could ever hope for. I’m grateful for you too! I can’t wait to hear what you have planned for the pennies. I love how God has made you to show love to others with such creativity. Praying for you! Thank you for always spurring me on in all areas of my life. I esp. thank you for the prayers. Love you! Great idea for encouraging your husband. Our ego’s are so tied to our jobs that it’s hard to be out of work. Good job making him still feel like you desire to spend time with him regardless of his employment.